A water’s-edge sentinel stands guard over Rainbow Lake. Ira Spring Trail, July 04, 2013. Several lakes in the southwest corner of the Alpine Lakes Wilderness, including Mason, Rainbow, and Island lakes, lie along the Ira Spring Trail that can be accessed from either end and by multiple trailheads. By whatever route, the trails traverse varied terrain that includes woodland, meadows, boulderfields, and, of course, the wilderness area’s namesake lakelands. Beyond the popular Mason Lake, the much less travelled portion of the trail north of Bandera Mountain offers a bit of backcountry quietude away from the crowds and the distant but constant rush of Interstate 90 that is common to many other trails along the South Fork Snoqualmie River Valley. The western route to Mason, Rainbow, and Island lakes via the Ira Spring Trail crosses Bandera Mountain‘s lower, southern flank before continuing around to the lakes on its west and north. The lakes can also be accessed farther east from the trails to Talapus Lake and Pratt Lake by crossing the Pratt Mountain Saddle and visiting the lakes in reverse order. From the Talapus Lake trailhead, the round-trip to and from Mason Lake is 8.70 miles/14.00 km; via the Pratt Lake trailhead, the round-trip distance to and from Mason Lake is just slightly longer at 9.20 miles/14.80 km. The trail is named in honor of Ira Spring, a local nature photographer, author of numerous hiking guides, and advocate of wilderness preservation through public access. At a time when many argued that nature could only be conserved in the isolation of restricted access, Ira Spring was a leader in the creation of the well-developed and -maintained trail system enjoyed throughout Washington today. From its trailhead, the Ira Spring Trail begins gently enough on the remains of a fern-lined gravel road beneath dense, deciduous forest before veering steeply upward at approximately 1.60 miles/2.60 km from the trailhead. Ira Spring Trail, July 09, 2016. Spilling from Mason Lake high above, Mason Creek scampers beneath a sturdy log bridge approximately 0.80 miles/1.30 km from the trailhead. Ira Spring Trail, July 09, 2016. 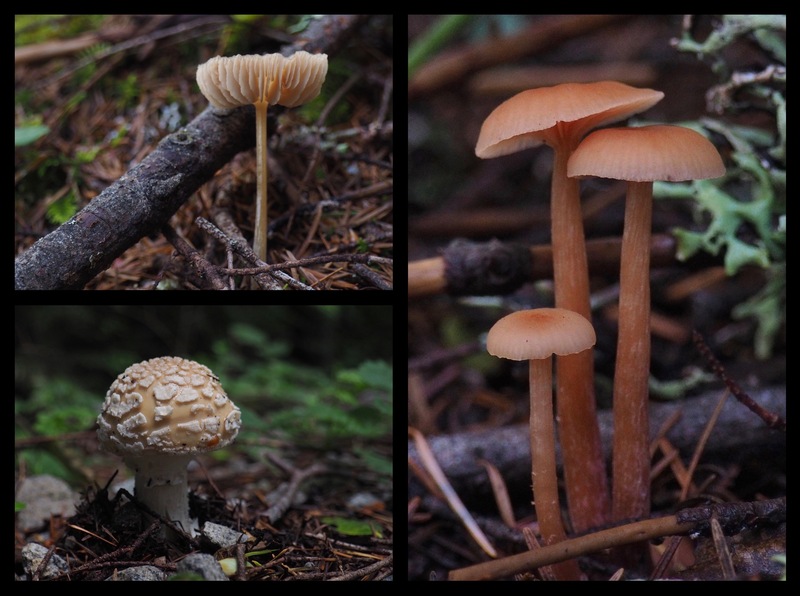 Watch for whimsically capped mushrooms posing here and there amongst the lowland forest litter. Ira Spring Trail, July 09, 2016. Sun-shy blooms accent the leafy lowland forest along the Ira Spring Trail’s lower wayside. 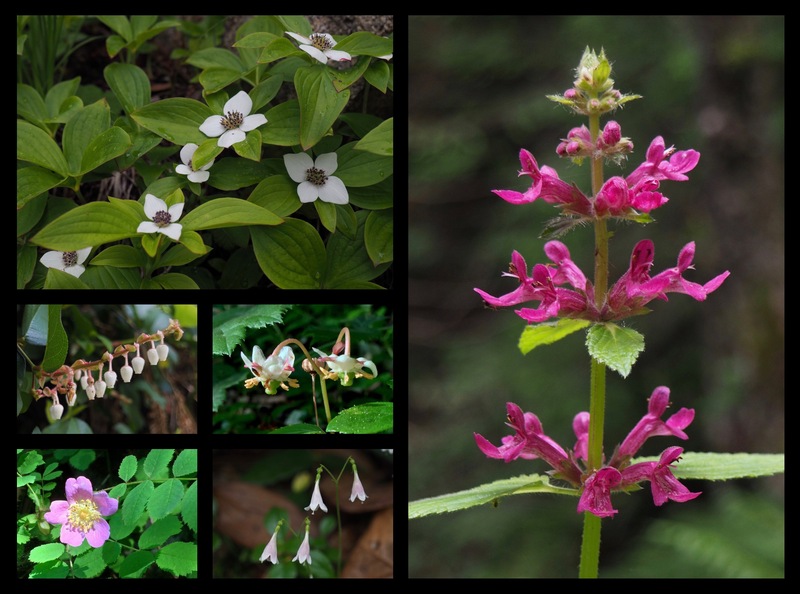 Look for swaths of western bunchberries (Cornus unalaschkensis) (upper left); pearly strings of salal (Gaultheria shallon) (center left); whirligig-like Menzies’ pipsissewas, or, little prince’s-pines (Chimaphila menziesii) (center); wiry-stemmed wood roses (Rosa gymnocarpa) (lower left); eponymously paired American twinflowers (Linnaea borealis) (lower center); and unfortunately misnamed and non-stinging Cooley’s hedge-nettles (Stachys cooleyae) (right). Ira Spring Trail, July 09, 2014 and July 02 and 17, 2016. 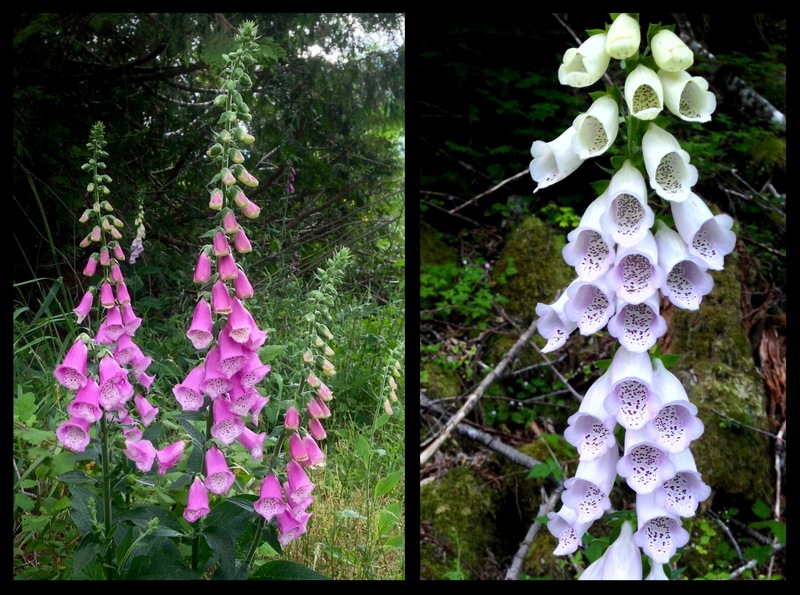 A familiar favorite throughout Pacific Northwest woodlands, the exotic-looking purple foxglove (Digitalis purpurea) is actually a Near East native gone wild from domestic North American gardens. Ranging in hue from ghostly to vibrant, its lolling bells on impressive six-foot/two-meter stalks brighten shady lowland forests, including those along the Ira Spring Trail. Ira Spring Trail, July 05 and 09, 2014. As the trail clears the forest, McClellan Butte’s distinctive pinnacle dominates the southwestern view from Bandera Mountain, here framed by the flaming autumn leaves of vine maple (Acer circinatum). Ira Spring Trail, October 05, 2013. Above the treeline, the trail flattens as it continues across Bandera Mountain‘s open flank, where a backward glance affords a picturesque glimpse of Mt. Rainier rising to the southeast. Ira Spring Trail, July 09, 2014. 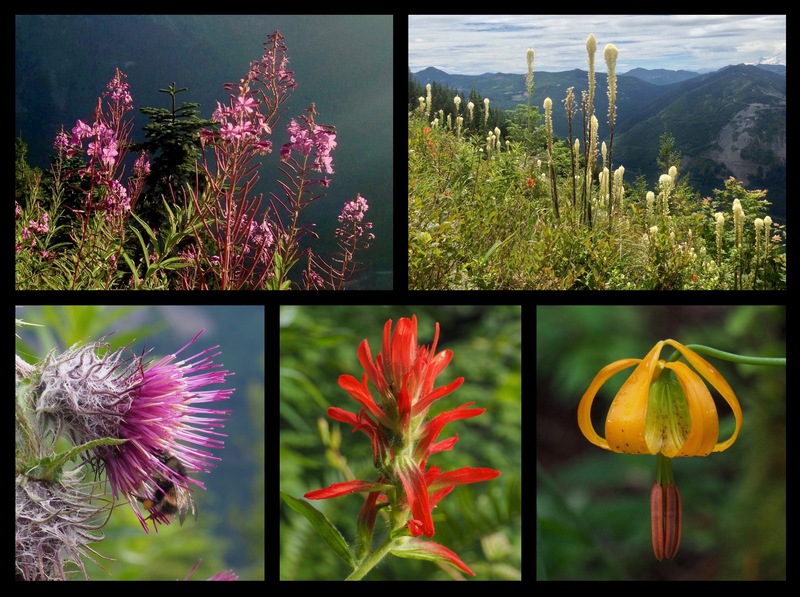 The Ira Spring Trail’s switchbacks across Bandera Mountain‘s treeless middle slope offer a sampling of the riotous wildflower display that carpets its alpine meadow to the summit, including, clockwise from the top right, candle-like plumes of beargrass (Xerophyllum tenax), ever bowing teardrops of Columbia lilies (Lilium columbianum), vivid torches of scarlet paintbrushes (Castilleja miniata), and exotically bristled edible thistles (Cirsium edule). Later in the summer, willowy drifts of fireweed (Chamerion angustifolium) brighten the airy wayside (top left). To reach Bandera Mountain‘s summit, take the signed side trail at the corner of the Ira Spring Trail’s last, long switchback across the mountainside. 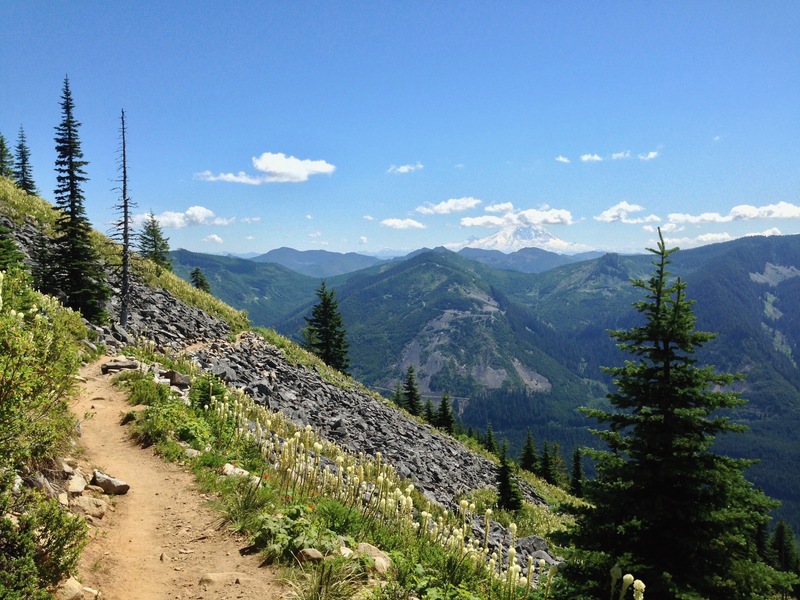 Ira Spring Trail, July 05, 2014, July 09, 2016, and August 18, 2013. 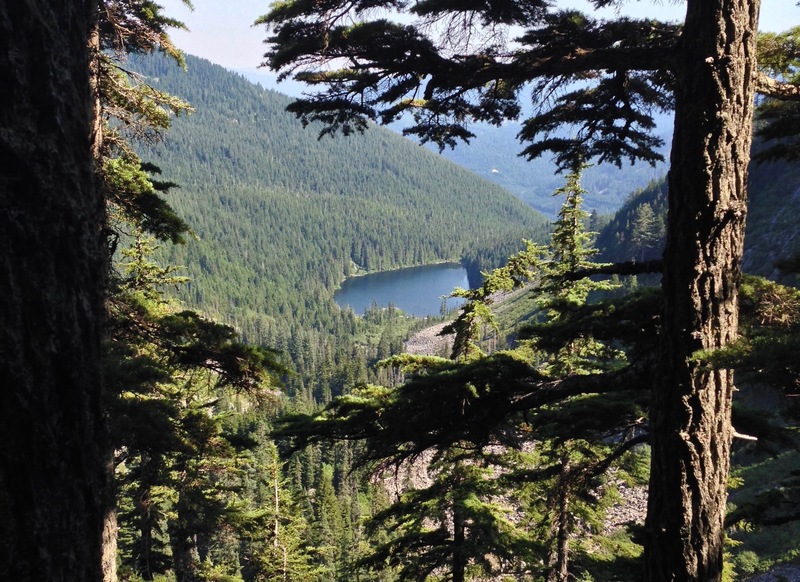 The Ira Spring Trail rounds Bandera Mountain and immediately drops into cool, coniferous forest on its approach to Mason Lake. Ira Spring Trail, September 10, 2012. Upon passing Bandera Mountain, the Ira Spring Trail enters the Alpine Lakes Wilderness, set aside by Congress for preservation in its natural state with minimal human imprint. (“A wilderness . . . is hereby recognized as an area where the earth and its community of life are untrammeled by man, where man himself is a visitor who does not remain.” Wilderness Act of 1964). While signing the act creating the Alpine Lakes Wilderness – against stiff opposition – U.S. President Gerald Ford reportedly commented “Anywhere so beautiful should be preserved.” And so it is. This corner of the Alpine Lakes Wilderness especially exemplifies its name, dotted everywhere with mountain lakes, ponds, and bogs. Mason Lake, here swathed in evening’s last light, is the first of several lakes encountered shortly after the Ira Spring Trail enters the Alpine Lakes Wilderness. Ira Spring Trail, August 18, 2013. 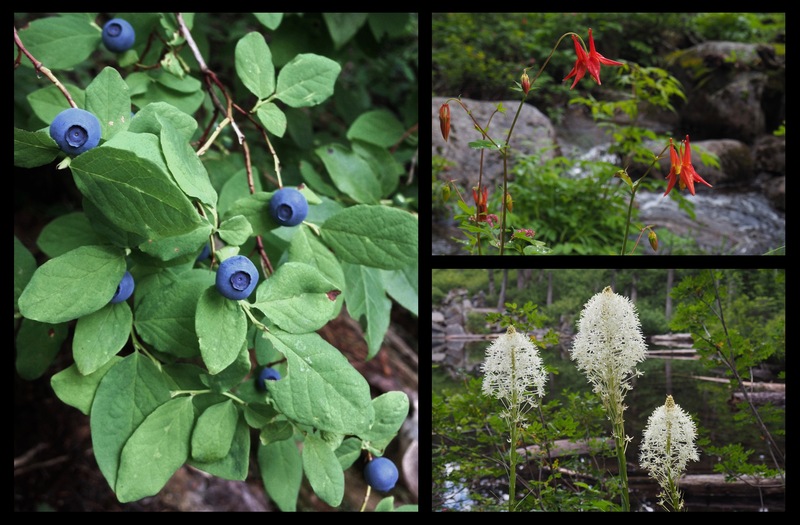 Along Mason Lake’s banks, look for luscious blueberries and huckleberries (here, the tart-tasting, upward-facing berries of Vaccinium ovalifolium, called both the oval-leaved blueberry and oval-leaved huckleberry) (left); western, or, Sitka columbines (Aquilegia formosa) dangling over Mason Creek’s newborn stream (upper right); and bottlebrush blooms of beargrass (Xerophyllum tenax) lining the shore (lower right). Ira Spring Trail, August 18, 2013 and July 09, 2016. From the Ira Spring Trail on Mason Lake’s northern shore, a quarter-mile/0.40-km boot path leads through a quiet bog to Little Mason Lake. Ira Spring Trail, September 10, 2012. At the end of a short bootpath northwest from the Ira Spring Trail, forest frames glimpses of Little Mason Lake, where woodland ranks recede toward the waters’ exit on its far shore. Ira Spring Trail, August 10, 2014. The forest gazes down upon its reflection in a lily pond along the bootpath to Little Mason Lake. Ponds paved with the classic lily pad leaves and unusual blooms of the spatterdock, or, yellow pond lily (Nuphar polysepala) are a common feature of this corner of the Alpine Lakes Wilderness. Ira Spring Trail, September 10, 2012. 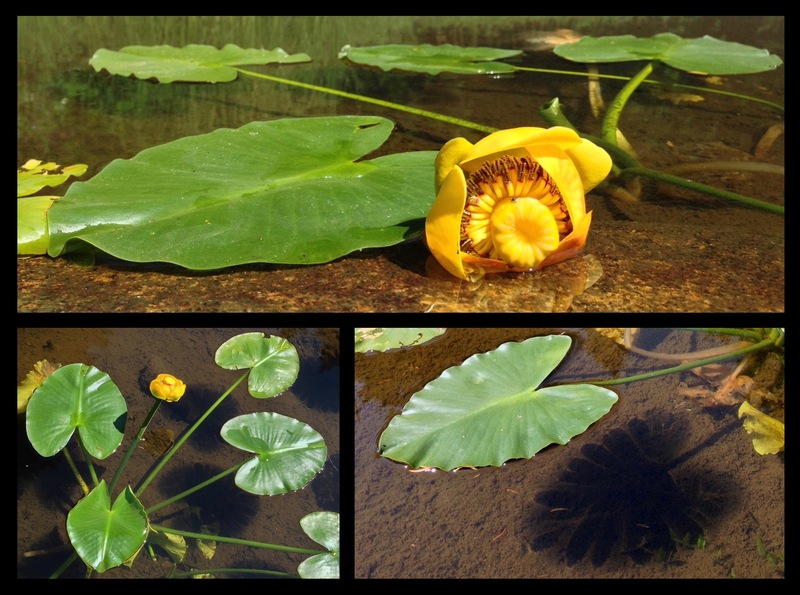 Spatterdock, or, yellow pond lilies (Nuphar polysepala) loft complex, squarish blooms above hovering leaves that cast X-ray-like shadows on the soft earth beneath the water’s surface. Ira Spring Trail, August 10, 2014. 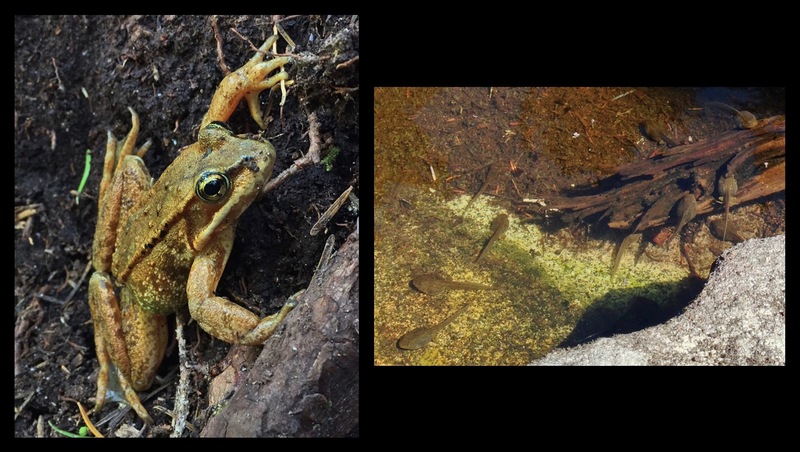 Frogs, here likely a Cascades frog (Rana cascadae), are abundant in the Alpine Lakes Wilderness, fattening lazily as tadpoles in its warm summer bogs, ponds, and shallow lakes. Ira Spring Trail, July 02, 2016 and August 10, 2014. Scarcely a quarter mile/0.40 km beyond Mason Lake, a side trail diverges southwestward to Mount Defiance whilst the Ira Spring Trail continues eastward to another clutch of lakes, as noted by signage. The Ira Spring Trail climbs the small ridge on the northeast end of Mason Lake through dense forest before descending again to the lake-filled flatland between Pratt Mountain on the north and Bandera Mountain on the south. Folded creases in a rock wall along the ridge north of Mason Lake suggest its formation from a less solid state eons ago. Ira Spring Trail, August 10, 2014. Near the top of the ridge, a seemingly out-of-place jumble of giant boulders forms a low, deep cave beside the trail, no doubt used for shelter on occasion by forest creatures. Ira Spring Trail, July 17, 2016. Just after descending the ridge, the Ira Spring Trail rounds a charming, rock-lined lakelet set against the backdrop of Bandera Mountain. Although sizeable, the unnamed lakelet will likely remain nameless, given the National Park Service’s policy of refusing approval of designations for geographic features not already identified at the time land is protected as a wilderness area, in order to preserve its truly wild character. Ira Spring Trail, September 16, 2012. A scant mile/1.60 km from the lakelet, the trail crosses a couple of boggy, frog-rife streams. A barely visible bootpath follows the second outlet stream north (left) a few hundred feet/150 meters around a verdant lily pond and over a ridge to an unexpected view of Blazer Lake, completely obscured by the forest along the main trail. Ira Spring Trail, August 10, 2014. Eastward again on the Ira Spring Trail, Rainbow Lake reaches sight almost immediately. Short bootpaths lead to additional viewpoints along its shore. Ira Spring Trail, September 16, 2012. In early summer, pink mountain-heath (Phyllodoce empetriformis) (left) brightens the boggy uplands around the lakes. 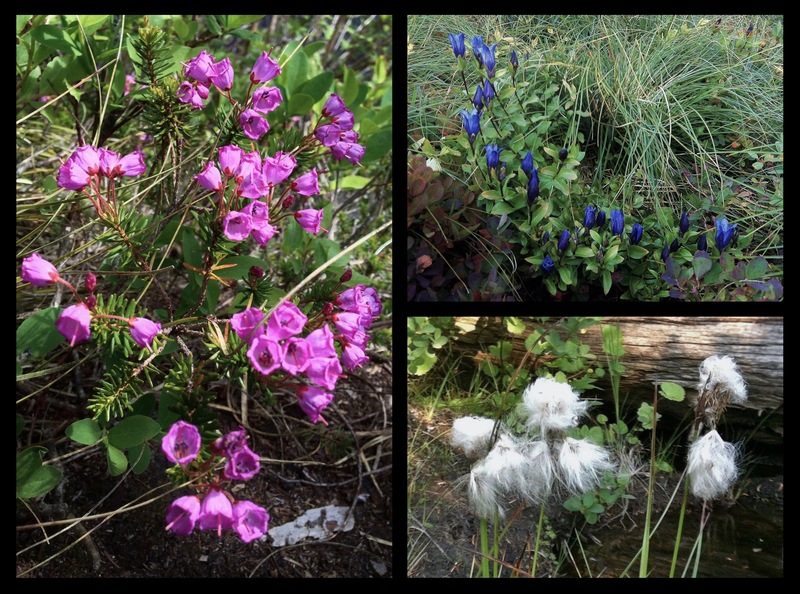 Later in the summer and autumn, mountain bog gentians (Gentiana calycosa) (upper right) bloom in jewel-like drifts and cotton grass (Eriophorum sp.) (lower right) hoists tiny, threadbare white flags throughout. Ira Spring Trail, July 04, 2013 and September 16, 2012. Just beyond Rainbow Lake, a side trail marked by a small wooden sign leads a half mile/0.80 km southwest to Island Lake through lush meadows, bogs, and woodland. Ira Spring Trail, July 17, 2016. Just before reaching Island Lake, the ridgetop side trail affords a peekaboo view of Talapus Lake lying far down the valley below, where Island Lake’s waters next pause before continuing their journey. Ira Spring Trail, August 10, 2014. Island Lake is set in a deep, rocky basin at the northern foot of Bandera Mountain and bordered round about by forest. Its eponymous “islands” are a barely visible ridge of rocks that scarcely breaks the waters’ surface, one capped by a few tiny trees and a small patch of other vegetation. Ira Spring Trail, August 17, 2014. A small, unforested spit below the campground on Island Lake’s shore affords a view of the placid waters beyond. Ira Spring Trail, August 10, 2014. Beyond the side trail to Island Lake, the Ira Spring Trail traverses the high, open flanks of Pratt Mountain, providing views of the northeast slope of Bandera Mountain and occasional glimpses of Talapus and Olallie lakes below before its junction with the trail to Pratt Lake at the Pratt Lake Saddle. To continue beyond the Ira Spring Trail, follow signage north at the junction to reach Pratt Lake or continue east to reach the side trail to Talapus and Olallie lakes. Ira Spring Trail, July 04, 2013. 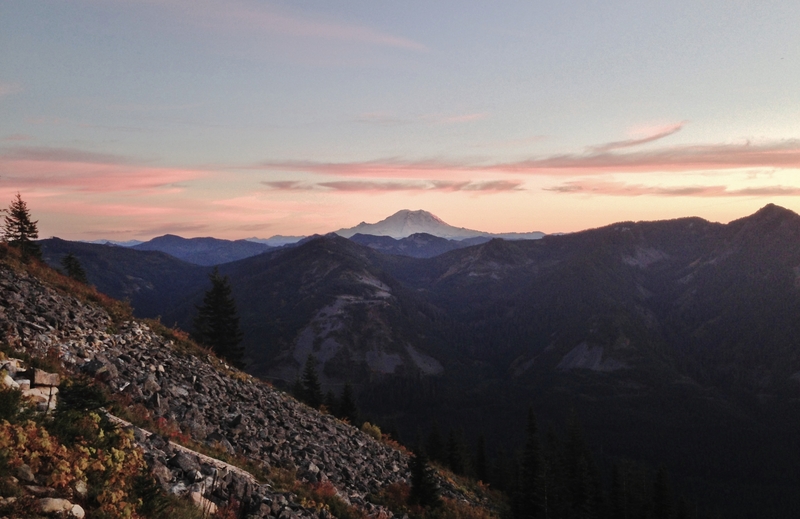 For those hiking late in the day or camping along Mason Lake, the Ira Spring Trail’s open section on Bandera Mountain‘s southern flank affords magnificent sunset views. Here, Mt. Rainier’s stately silhouette deepens in twilight’s rosy calm. Be sure to carry a flashlight, as night darkens the heavy forest cloaking the mountain’s feet long before light lingering above has faded. Ira Spring Trail, October 05, 2013. Day’s last torchlight blazons the verge of night. Ira Spring Trail, October 05, 2013.